Volo's Guide to Monsters is a Dungeons & Dragons bestiary for 5th Edition, published by Wizards of the Coast, and is officially available on the Roll20 Marketplace. When you purchase Volo's Guide to Monsters through Roll20, you get a bundle that comes in two parts: It unlocks the Volo's Index of pages on the the 5th Edition SRD Compendium and you gain access to a module and an Addon version that includes the seven beast lair battle maps that have been pre-aligned and drawn with Dynamic Lighting. When you buy a copy of Volo's through Roll20, you don't get a PDF of the book. Instead, you unlock the entire contents of the book transferred directly into the 5th Edition SRD Compendium. Each monster, piece of lore, and new player race has been given their own dedicated Compendium entry. Note: If you do not have Volo's Guide to Monsters purchased, the following pages in the next section will not be accessible through the Compendium. Lore - The contents in this section go at great length expanding upon some of Dungeons & Dragons' most prolific monsters. Each entry has its own dedicated beast lair that is available in the module portion of this bundle purchase. One of the benefits of transferring Volo's into Compendium form is being able to use it directly in a Roll20 game. A GM is able to drag and drop a Volo's Guide entry from the 5th Edition Compendium directly into their game. For monsters, dragging its entry to the tabletop creates a statted token AND generates a new NPC character journal under your Journal tab that will be linked to it. This NPC sheet will be automatically set up with all that monster's attributes, traits and skills that you can roll from immediately. Additionally, any non-monster entry such as rules, lore, items, et cetera that you drag to the Tabletop will create a Handout of that entry that you can share with your players. First, you will need to add the Compendium to your 5th Edition game if you haven't done so already. To do this, you either create a new game using a 5th Edition Character Sheet or go to your Game Settings after the fact and add the Character Sheet that way. (For best Drag and Drop compatibility with the Compendium, we recommend using the Official Roll20 5th Edition Character Sheet) This setup happens by default if you've built a game using our existing Marketplace products such as the Lost Mine of Phandelver or Storm King's Thunder modules. Once added, a new tab will be added to the Sidebar situated between the Journal and Jukebox tab. Symbolized by a lowercase "i" in a circle i, this is the Compendium Tab. The search bar operates exactly as the one found on the exterior webpage version of the Compendium. 5th Edition Dungeons & Dragons has many books of content. A Book Source ID has been applied to all additional physical books of content added to the 5th Edition Compendium. This will allow you to keep track of where an entry is coming from. To the right of any Compendium entry found on the Compendium Tab is a three digit Source ID directing towards a specific book. Several screenshots showing how to drag and drop from the Compendium to the tabletop and creating a linked token and character journal at the same time. This action will begin the automation process. A handout will be created in your Journal Tab containing all of the text and images contained within the entry. 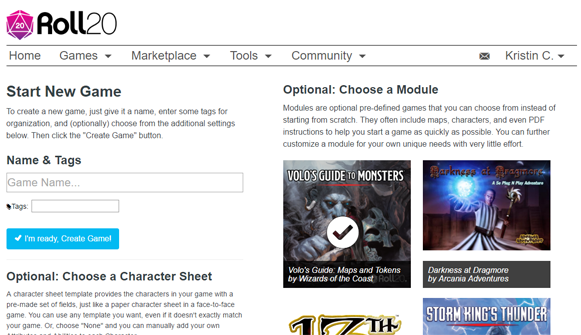 For Volo's content, this allows a GM to share the content with your players who do not have access to the Marketplace bundle. Dragging and dropping a monster entry creates a Character Journal on the Journal Tab for the monster. It will set the sheet to the NPC version and have all of the Compendium's attributes, traits, skills, and actions already inputted. The lore, images and description of the monster entry will be listed in the character journal's bio as well. For Volo's monsters that come with a token graphic, after creating the character journal for the monster, a token will be generated on the Tabletop that will be statted with the HP and AC of the desired creature. The Roll20 Marketplace bundle is available as a module AND an addon that includes the seven monster lairs that are included in Volo's Guide to Monsters as well as a page that includes all the token art* made for the various monster entries within the book. Each lair has Dynamic Lighting pre-drawn on the maps for your convenience. Each Monster Lair comes with its own Handout guide in the Journal Tab that describes each room of a given lair as well as list traps and points of interest. * These tokens are not statted nor tied to a character journal. They are just images for the GM to use as they see fit. When you Create a New Game, on the right hand side of the creation page is a section called Optional: Choose a Module. Listed here will be various modules available on the Marketplace. Volo's Guide to Monsters (a thumbnail of the image you see at the top of this page) will be listed here too. 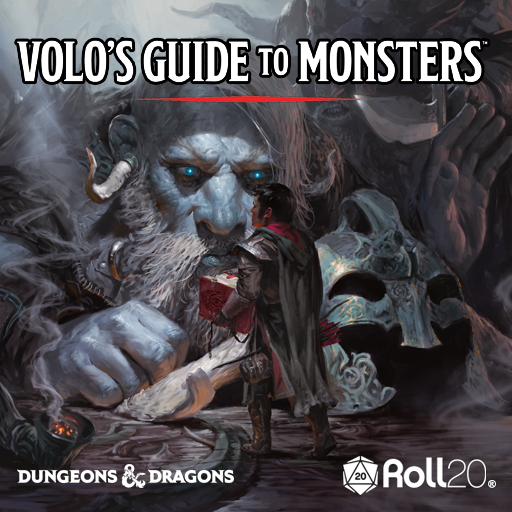 After purchasing this bundle, a big white checkmark icon will appear over the thumbnail when you hover your mouse over the Volo's Guide to Monsters option. This showcases that you have this module unlocked (Content that has not been purchased yet will reveal a shopping cart icon and will link you to its Marketplace listing). Click on the thumbnail to select it. 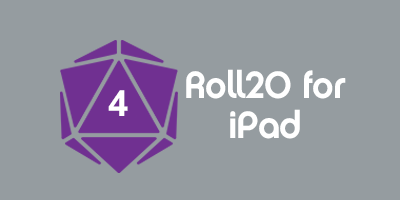 This will assign this module as the template for your new game as well as automatically choose the Official Roll20 OGL Character Sheet to be applied to it. Name the game whatever you wish and click the blue ✔ I'm ready, Create Game! button to create the your new game. 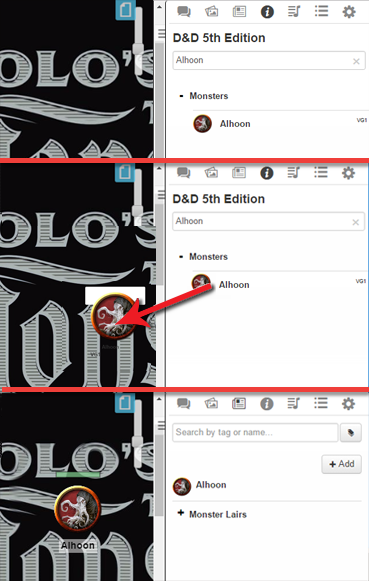 After a moment, Roll20's application will open with your new game and Volo's lair content will be available to you as well as access to the 5th Edition character sheet and Compendium. The Addon version doesn't require creating a new game. You can add it into an existing game. On the Game Details page, there is a section underneath the Game Description for adding Game Addons. Click on it to unroll its options and you'll be able to select Volo's from the drop down menu that appears. Click on the Add To Game to add the content to your existing game. Pro Subscribers have access to the Transmogrifier tool. This will allow them to pluck a singular lair page and place it into another existing campaign. Dev Note 11/8/2016: We are currently building a means for non Pro subscribers to be able to transmogrify Volo's content without needing a Pro account. Token Art: There were a handful of creatures where we were unfortunately not allowed to contract artwork for. In those instances, we created a token that has the name of the creature inside it in place of art. Black Guard Drake, Deep Rothé, Orc Hand of Yurtrus, Rothé, Stench Cow, and White Guard Drake are the creatures that are treated in this fashion. Player Access: Players do not have direct access to Volo's Guide to Monsters within the In-App Roll20 Compendium. The GM can drag and drop any entry from the Compendium as either a Character or Handout (depending on the entry type) into their Journal to be available for player use. Other 5th Edition Character Sheets: We can't guarantee that the Compendium Drag and Drop features will work predictably with other 5th Edition character sheets like the Community-Created and Shaped 5th Edition Sheets. Wizard of the Coast modules are designed with the Roll20 Official 5th Edition OGL Character Sheet in mind. Spellcasters: There was an intentional decision made with spellcaster monsters where we limited the individual spell entries down to the most commonly used offensive spells. For those we created a separate actions for each to be rolled from the sheet. We went with this method instead of having an NPC sheet with every single spell inputted under Spellcasting to keep the attribute bloat low to keep your games optimized. 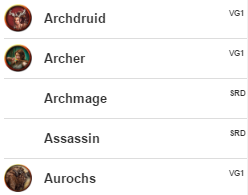 That being said, any spellcasting NPC should have all their spells listed under their Spellcasting Trait on the NPC sheet when you do a drag and drop from the Compendium. 11/4/2016 - Volo's Guide to Monsters launches. This page was last modified on 30 November 2017, at 17:06. This page has been accessed 45,353 times.